The Somali Republic is a Muslim country that is a combination of two former European colonies known as British Somaliland and Italian Somaliland. Somalia has been Muslim since A.D. 900 and today is considered one of the bases for pirates and for the terrorist group al-Qaeda. 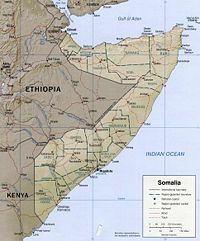 Roughly the size of New Jersey in area and population, Somalia is located in the Horn of Africa, its coastline on the Indian Ocean bordering Djibouti (the former French Somaliland), Ethiopia and Kenya. The capital city is Mogadishu. Somalia is located on the east coast of Africa on and north of the Equator and, with Ethiopia, Eritrea, Djibouti, and Kenya, is often referred to as the Horn of Africa. It comprises Italy's former Trust Territory of Somalia and the former British Protectorate of Somaliland (now seeking recognition as an independent state). The coastline extends 2,720 kilometers (1,700 mi.). The northern part of the country is hilly, and in many places the altitude ranges between 900 and 2,100 meters (3,000 ft.-7,000 ft.) above sea level. The central and southern areas are flat, with an average altitude of less than 180 meters (600 ft.). The Juba and the Shabelle Rivers rise in Ethiopia and flow south across the country toward the Indian Ocean. The Shabelle, however, does not reach the sea. Major climatic factors are a year-round hot climate, seasonal monsoon winds, and irregular rainfall with recurring droughts. Mean daily maximum temperatures range from 30oC to 40oC (85o F-105oF), except at higher elevations and along the east coast. Mean daily minimums usually vary from about 15oC to 30oC (60oF-85oF). The southwest monsoon, a sea breeze, makes the period from about May to October the mildest season in Somalia. The December–February period of the northeast monsoon also is relatively mild, although prevailing climatic conditions in Somalia are rarely pleasant. The "tangambili" periods that intervene between the two rainy seasons (October–November and March–May) are hot and humid. The Somali-populated region of the Horn of Africa stretches from the Gulf of Tadjoura in modern-day Djibouti through Dire Dawa, Ethiopia, and down to the coastal regions of southern Kenya. Unlike many countries in Africa, the Somali nation extends beyond its national borders. Since gaining independence in 1960, the goal of Somali nationalism, also known as Pan-Somalism, has been the unification of all Somali populations, forming a Greater Somalia. This issue has been a major cause of past crises between Somalia and its neighbors—Ethiopia, Kenya, and Djibouti. Today, about 60% of all Somalis are nomadic or semi-nomadic pastoralists who raise cattle, camels, sheep, and goats. About 25% of the population is settled farmers who live mainly in the fertile agricultural zone between the Juba and Shabelle Rivers in southern Somalia. The remainder of the population (15%-20%) is urban. Sizable ethnic groups in the country include Bantu agricultural workers, several thousand Arabs and some hundreds of Indians and Pakistanis. Nearly all inhabitants speak the Somali language, which remained unwritten until October 1973, when the Supreme Revolutionary Council (SRC) proclaimed it the nation's official language and decreed an orthography using Latin letters. Somali is now the language of instruction in schools, although Arabic, English, and Italian also are used extensively. Population (2006 est., no census exists): 8.8 million (of which an estimated 2 million in Somaliland). Population figures are difficult to estimate since the last census was completed in the 1970s and the instability of the country makes it impossible to collect this data. Annual growth rate (2006 est. ): 2.85%. Education: Literacy—total population that can read and write, 37.8%: male 49.7%; female 25.8%. Health: Infant mortality rate—114.9/1,000 live births. Life expectancy at birth—total population: 48.7 yrs. Work force (3.7 million; very few are skilled workers): Pastoral nomad—60%. Agriculture, government, trading, fishing, industry, handicrafts, and other—40%. Citizens are overwhelmingly Sunni Muslims of a Sufi tradition. There also is a very small, extremely low-profile Christian community, and small numbers of followers of other religions. The number of adherents to strains of conservative Islam and the number of Islamic schools supported by religiously conservative sources continued to grow. A transitional government, the components of which are known as the Transitional Federal Institutions (TFIs) was formed in 2004 following the conclusion of a 2-year reconciliation conference. The TFIs include a transitional parliament, known as the Transitional Federal Assembly (formed in August 2004), as well as a Transitional Federal Government (TFG) that includes a transitional President, Prime Minister and a cabinet known as the "Council of Ministers." For administrative purposes, Somalia is divided into 18 regions; the nature, authority, and structure of regional governments vary, where they exist. Abdullahi Yusuf Ahmed was elected as Transitional Federal President of Somalia in October 2004. On October 29, 2007, Ali Mohamed Gedi resigned as Prime Minister of the TFG; Nur "Adde" Hassan Hussein was appointed Prime Minister on November 22 and confirmed by the Parliament on November 24, 2007. Following a no-confidence motion against former Speaker of Parliament Shariff Hassan Sheikh Adan on January 17, Sheikh Adan Mohamed Nur was elected the new Speaker on January 31, 2007. A cabinet known as the Council of Ministers also exists; Prime Minister Hussein is in the process of forming a new cabinet. In early 2002, Kenya organized a reconciliation effort under IGAD auspices known as the Somalia National Reconciliation Conference, which concluded in October 2004. In August 2004, the Somali Transitional Federal Assembly (TFA) was established as part of the IGAD-led process. Abdullahi Yusuf Ahmed was elected President of the Transitional Federal Government (TFG) of Somalia on October 10, 2004. The components of the TFG, including the Parliament and Executive, are known as the Transitional Federal Institutions (TFIs). Two regional administrations exist in northern Somalia—the self-declared "Republic of Somaliland" in the northwest and the semi-autonomous region of Puntland in the northeast. In Somaliland, which is made up of the former British protectorate, Dahir Riyale Kahin was elected President in presidential elections deemed free and fair by international observers in May 2003. The area of Puntland declared itself autonomous (although not independent) in 1998 with its capital at Garowe. General Mohamed Adde Muse was elected President by the Puntland parliament in January 2005. Puntland declared it would remain autonomous until a federated Somalia state was established. Somalia followed a foreign policy of nonalignment for a brief period following independence. In 1970, the Siad Barre regime declared a national ideology based on scientific Socialism and aligned its foreign policy with the Soviet Union and China. In the 1980s, Somalia shifted its alignment to the West following a territorial conflict with Ethiopia over the disputed Somali-populated region of the Ogaden from 1977–78, which was supported by the Soviet Union. The central government also sought ties with many Arab countries, and continued to receive financial and military support from several Arab countries prior to its collapse in 1991. In 1963, Somalia severed diplomatic relations with the United Kingdom for a period following a dispute over Kenya's Somali-populated northeastern region (Northern Frontier District), an area inhabited mainly by Somalis. Related problems have arisen from the boundary with Ethiopia and the large-scale migrations of Somali nomads between Ethiopia and Somalia. In the aftermath of the 1977-78 war between Somalia and Ethiopia, the Government of Somalia continued to call for self-determination for ethnic Somalis living in the Ogaden region of eastern Ethiopia. At the March 1983 Nonaligned Movement summit in New Delhi, President Siad Barre stated that Somalia harbored no expansionist aims and was willing to negotiate with Ethiopia over the disputed Ogaden region. Following the collapse of the Barre regime, the foreign policy of the various entities in Somalia, including the Transitional Federal Government, has centered on gaining international recognition, winning international support for national reconciliation, and obtaining international economic assistance. Somalia lacks natural resources and faces major development challenges, and recent economic reverses have left its people increasingly dependent on remittances from abroad. Its economy is pastoral and agricultural, with livestock—principally camels, cattle, sheep, and goats—representing the main form of wealth. Livestock exports in recent years have been severely reduced by periodic bans, ostensibly for concerns of animal health, by Arabian Peninsula states. Drought has also impaired agricultural and livestock production. Because rainfall is scanty and irregular, farming generally is limited to certain coastal districts, areas near Hargeisa, and the Juba and Shabelle River valleys. The agricultural sector of the economy consists mainly of banana plantations located in the south, which has used modern irrigation systems and up-to-date farm machinery. A small fishing industry exists in the north where tuna, shark, and other warm-water fish are caught, although fishing production is seriously affected by poaching. Aromatic woods—frankincense and myrrh—from a small and diminishing forest also contribute to the country's exports. Minerals, including uranium and likely deposits of petroleum and natural gas, are found throughout the country, but have not been exploited commercially. Petroleum exploration efforts have ceased due to insecurity and instability. Illegal production in the south of charcoal for export has led to widespread deforestation. With the help of foreign aid, small industries such as textiles, handicrafts, meat processing, and printing are being established. The absence of central government authority, as well as profiteering from counterfeiting, has rapidly debased Somalia's currency. By the spring of 2002, the Somali shilling had fallen to over 30,000 shillings to the U.S. dollar. The self-declared Republic of Somaliland issues its own currency, the Somaliland shilling, which is not accepted outside of the self-declared republic. There are no railways in Somalia; internal transportation is by truck and bus. The national road system nominally comprises 22,100 kilometers (13,702 mi.) of roads that include about 2,600 kilometers (1,612 mi.) of all-weather roads, although most roads have received little maintenance for years and have seriously deteriorated. Air transportation is provided by small air charter firms and craft used by drug smugglers. A number of airlines operate from Hargeisa. Some private airlines, including Daallo Airlines, serve several domestic locations as well as Djibouti and the United Arab Emirates. The UN and other NGOs operate air service for their missions. The European Community and the World Bank jointly financed construction of a deepwater port at Mogadishu (currently closed). The Soviet Union improved Somalia's deepwater port at Berbera in 1969. Facilities at Berbera were further improved by a U.S. military construction program completed in 1985, but they have since become dilapidated. During the 1990s the United States renovated a deepwater port at Kismayo that serves the fertile Juba River basin and is vital to Somalia's banana export industry. Smaller ports are located at Merca, Brava, and Bossaso. Absence of security and lack of maintenance and improvement are major issues at most Somali ports. Radiotelephone service is available to both to regional and international locations. The public telecommunications system has been destroyed or dismantled, but cellular phone service is readily available throughout the country. Somalia is linked to the outside world via ship-to-shore communications (INMARSAT) as well as links to overseas satellite operators by private telecommunications operators (including cellular telephone systems) in major towns. Radio broadcasting stations operate at Mogadishu, Hargeisa, and Galkaiyo, with programs in Somali and some other languages. There are two television broadcast stations in Mogadishu and one in Hargeisa. GDP (2005 est. ): U.S. $4.809 billion. Annual growth rate (2005 est. ): 2.4%. Per capita GDP (2005 est. ): $600. Natural resources: Largely unexploited reserves of iron ore, tin, gypsum, bauxite, uranium, copper, and salt; likely petroleum and natural gas reserves. Agriculture: Products—livestock, fish, bananas, corn, sorghum, sugar. Arable land—13%, of which 2% is cultivated. Industry: Types—Telecommunications, livestock, fishing, textiles, transportation, and limited financial services. Somalia's surprisingly innovative private sector has continued to function despite the lack of a functioning central government since 1991. Trade: Exports--$241 million (f.o.b., 2004 est. ): livestock, bananas, hides, fish, charcoal, scrap metal. Major markets—United Arab Emirates, Yemen, Oman. Imports--$576 million (f.o.b., 2004 est. ): food grains, animal and vegetable oils, petroleum products, construction materials, manufactured products, qat. Major suppliers—Djibouti, Kenya, Brazil, India, United Arab Emirates, Oman. Aid disbursed: N/A. Primary aid donors—United States, European Union, Australia, Canada, Denmark, France, Germany, Italy, Japan, Netherlands, Norway, Sweden, Switzerland, United Kingdom. Remittances (2006 est. ): $800 million to $1 billion. During the first two decades of this century, British rule was challenged through persistent attacks by a dervish rebellion led by Mohamed Abdullah, known as the "Mad Mullah" by the British. A long series of intermittent engagements and truces ended in 1920 when British warplanes bombed Abdullah's stronghold at Taleex. Although Abdullah was defeated as much by rival Somali factions as by British forces, he was lauded as a popular hero and stands as a major figure of national identity to many Somalis. Following Italy's declaration of war on the United Kingdom in June 1940, Italian troops overran British Somaliland and drove out the British garrison. In 1941, British forces began operations against the Italian East African Empire and quickly brought the greater part of Italian Somaliland under British control. From 1941 to 1950, while Somalia was under British military administration, transition toward self-government was begun through the establishment of local courts, planning committees, and the Protectorate Advisory Council. In 1948 Britain turned the Ogaden and neighboring Somali territories over to Ethiopia. In June 1961, Somalia adopted its first national constitution in a countrywide referendum, which provided for a democratic state with a parliamentary form of government based on European models. During the early post-independence period, political parties were a fluid concept, with one-person political parties forming before an election, only to defect to the winning party following the election. A constitutional conference in Mogadishu in April 1960, which made the system of government in the southern Somali trust territory the basis for the future government structure of the Somali Republic, resulted in the concentration of political power in the former Italian Somalia capital of Mogadishu and a southern-dominated central government, with most key government positions occupied by southern Somalis, producing increased disenchantment with the union in the former British-controlled north. Pan-Somali nationalism, with the goal of uniting the Somali-populated regions of French Somaliland (Djibouti), Kenya and Ethiopia into a Greater Somalia, remained the driving political ideology in the initial post-independence period. Under the leadership of Mohamed Ibrahim Egal (prime minister from 1967 to 1969), however, Somalia renounced its claims to the Somali-populated regions of Ethiopia and Kenya, greatly improving its relations with both countries. Egal attempted a similar approach with Ethiopia, but the move towards reconciliation with Ethiopia, which had been a traditional enemy of Somalia since the 16th century, made many Somalis furious, including the army. Egal's reconciliation effort toward Ethiopia is argued to be one of the principal factors that provoked a bloodless coup on October 21, 1969 and subsequent installation of Maj. Gen. Mohamed Siad Barre as president, bringing an abrupt end to the process of party-based constitutional democracy in Somalia. Following the coup, executive and legislative power was vested in the 20-member Supreme Revolutionary Council (SRC), headed by Barre. The SRC pursued a course of "scientific socialism" that reflected both ideological and economic dependence on the Soviet Union. The government instituted a national security service, centralized control over information, and initiated a number of grassroots development projects. Barre reduced political freedoms and used military force to seize and redistribute rich farmlands in the interriverine areas of southern Somalia, relying on the use of force and terror against the Somali population to consolidate his political power base. The SRC became increasingly radical in foreign affairs, and in 1974, Somalia and the Soviet Union concluded a treaty of friendship and cooperation. As early as 1972, tensions began increasing along the Somali-Ethiopian border; these tensions heightened after the accession to power in Ethiopia in 1973 of the Mengistu Haile Mariam regime, which turned increasingly toward the Soviet Union. In the mid-1970s, the Western Somali Liberation Front (WSLF) began guerrilla operations in the Ogaden region of Ethiopia. Following the overthrow of the Ethiopian Emperor in 1975, Somalia invaded Ethiopia in 1977 in a second attempt to regain the Ogaden, and the second attempt initially appeared to be in Somalia's favor. The SNA moved quickly toward Harer, Jijiga, and Dire Dawa, the principal cities of the region. However, following the Ethiopian revolution, the new Ethiopian government shifted its alliance from the West to the Soviet Union, and the Soviet Union supplied Ethiopia with 10,000-15,000 Cuban troops and Soviet military advisors during the 1977-78 Ogaden war, shifting the advantage to Ethiopia and resulting in Somalia's defeat. In November 1977, Barre expelled all Soviet advisers and abrogated the friendship agreement with the U.S.S.R. In March 1978, Somali forces retreated into Somalia; however, the WSLF continued to carry out sporadic but greatly reduced guerrilla activity in the Ogaden. Such activities also were subsequently undertaken by another dissident group, the Ogaden National Liberation Front (ONLF). Following the 1977-1978 Ogaden war, desperate to find a strong external alliance to replace the Soviet Union, Somalia abandoned its Socialist ideology and turned to the West for international support, military equipment, and economic aid. In 1978, the United States reopened the U.S. Agency for International Development mission in Somalia. Two years later, an agreement was concluded that gave U.S. forces access to military facilities at the port of Berbera in northwestern Somalia. In the summer of 1982, Ethiopian forces invaded Somalia along the central border, and the United States provided two emergency airlifts to help Somalia defend its territorial integrity. From 1982 to 1988, the United States viewed Somalia as a partner in defense in the context of the Cold War. Somali officers of the National Armed Forces were trained in U.S. military schools in civilian as well as military subjects. Following the Ogaden war, the Barre regime violently suppressed opposition movements and ethnic groups, particularly the Isaaq clan in the northern region, using the military and elite security forces to quash any hint of rebellion. By the 1980s, an all-out civil war developed in Somalia. Opposition groups began to form following the end of the Ogaden war, beginning in 1979 with a group of dissatisfied army officers known as the Somali Salvation Democratic Front (SSDF). In 1981, as a result of increased northern discontent with the Barre regime, the Somali National Movement (SNM), composed mainly of the Isaaq clan, was formed in Hargeisa with the stated goal of overthrowing of the Barre regime. In January 1989, the United Somali Congress (USC), an opposition group of Somalis from the Hawiye clan, was formed as a political movement in Rome. A military wing of the USC was formed in Ethiopia in late 1989 under the leadership of Mohamed Farah "Aideed," a former political prisoner imprisoned by Barre from 1969-75. Aideed also formed alliances with other opposition groups, including the SNM and the Somali Patriotic Movement (SPM), an Ogadeen sub-clan force under Colonel Ahmed Omar Jess in the Bakool and Bay regions of Southern Somalia. In 1988, at the President's order, aircraft from the Somali National Air Force bombed the city of Hargeisa in northwestern Somalia, the former capital of British Somaliland, killing nearly 10,000 civilians and insurgents. The warfare in the northwest sped up the decay already evident elsewhere in the republic. Economic crisis, brought on by the cost of anti-insurgency activities, caused further hardship as Siad Barre and his cronies looted the national treasury. Left-wing poster about U.S. operation in Somalia. By the end of the 1980s, armed opposition to Barre's government, fully operational in the northern regions, had spread to the central and southern regions. Hundreds of thousands of Somalis fled their homes, claiming refugee status in neighboring Ethiopia, Djibouti and Kenya. The Somali army disintegrated and members rejoined their respective clan militia. Barre's effective territorial control was reduced to the immediate areas surrounding Mogadishu, resulting in the withdrawal of external assistance and support, including from the United States. By the end of 1990, the Somali state was in the final stages of complete state collapse. In the first week of December 1990, Barre declared a state of emergency as USC and SNM forces advanced toward Mogadishu. In January 1991, armed opposition factions drove Barre out of power, resulting in the complete collapse of the central government. Barre later died in exile in Nigeria. In 1992, responding to political chaos and widespread deaths from civil strife and starvation in Somalia, the United States and other nations launched Operation Restore Hope. Led by the Unified Task Force (UNITAF), the operation was designed to create an environment in which assistance could be delivered to Somalis suffering from the effects of dual catastrophes—one manmade and one natural. UNITAF was followed by the United Nations Operation in Somalia (UNOSOM). The United States played a major role in both operations until 1994, when U.S. forces withdrew. Following the collapse of the Barre regime in 1991, various groupings of Somali factions sought to control the national territory (or portions thereof) and fought small wars with one another. Approximately 14 national reconciliation conferences were convened over the succeeding decade. Efforts at mediation of the Somali internal dispute were also undertaken by many regional states. In the mid-1990s, Ethiopia played host to several Somali peace conferences and initiated talks at the Ethiopian city of Sodere, which led to some degree of agreement between competing factions. The Governments of Egypt, Yemen, Kenya, and Italy also have attempted to bring the Somali factions together. In 1997, the Organization of African Unity and the Intergovernmental Authority on Development (IGAD) gave Ethiopia the mandate to pursue Somali reconciliation. In 2000, Djibouti hosted a major reconciliation conference (the 13th such effort), which in August resulted in creation of the Transitional National Government (TNG), whose 3-year mandate expired in August 2003. The absence of a central government in Somalia also allowed outside forces to become more influential by supporting various groups and persons in Somalia, particularly Djibouti, Eritrea, Ethiopia, Egypt, Yemen, and Libya, all of which have supported various Somali factions and transitional governments. Somali Islamists: A potential ally? by Dr. Afyare Abdi Elmi.